Former Rascals, Murray Tap, in 121-year old building, embraces new East Side. Izzy Hops Swig & Nosh. Photo by Michael Horne. 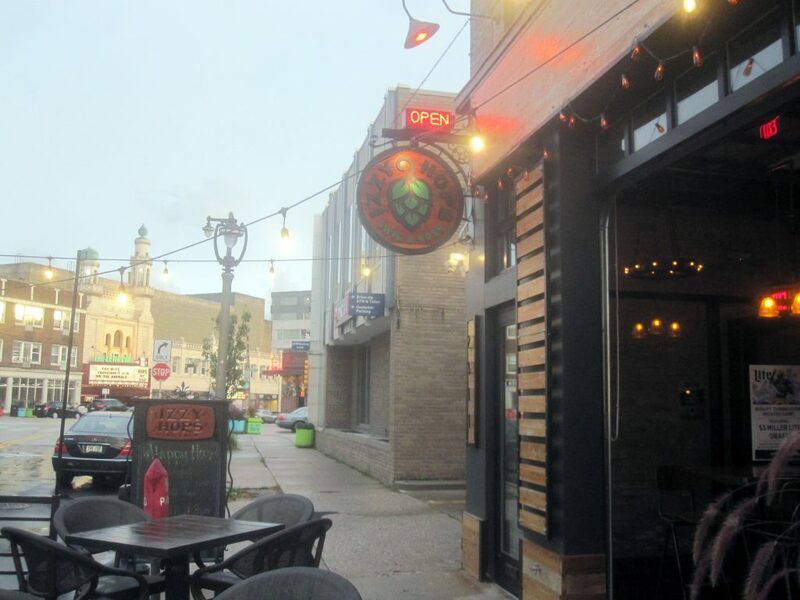 The tavern district of East North Avenue is undergoing a number of changes. Once lined with dozens of legendary taverns, only five stalwart bars remain: Hooligan’s, Landmark Lanes, Jazz Estate, Von Trier and Vitucci’s. Gone, among others, are Judge’s, Hotel Foster, Rosati’s, Hotch, Yield, Library Club, RC’s, G-Daddy’s BBC, Nick’s House, The Eastsider, Winchester and Rascals — reopened in some cases, repurposed in others, and even torn down altogether. Winchester and Rascals occupied a single building on N. Murray Ave., just around the corner from the thoroughfare. The Winchester space is now repurposed as Kawa Ramen and Sushi, while Rascal’s is now reopened as Izzy Hops. Both debuted in 2017 in an 1897 building owned since 2012 by Michael Vitucci, a grandson of the founder of Vitucci’s. That bar is now owned by cousins, while Vitucci has his hands full running this place, the Belmont Tavern, Whiskey Bar, Caffrey’s Pub and Murphy’s Irish Pub. 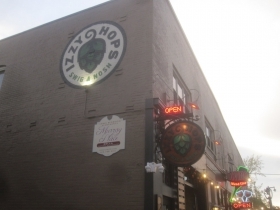 Izzy Hops Swig & Nosh occupies 2311 N. Murray Ave., in the southernmost end of this two-story building, which was constructed as a non-tavern commercial structure for its original owner, the Jos. Schlitz Brewery. It is the final portion of the building to have been rehabilitated. Although Rascal’s had a facade restoration some years ago, the interior was well-used, and the mechanical systems were a mess. Before Rascal’s opened in 1999, the space was known as the Murray Tap, which itself was mourned at the time of its demise in 1985. It was a tavern opened by Joseph F. Alioto in 1933, and may have served as such during Prohibition under the guise of a lunch counter. In 1953 it was bought by Pat Belfer, who sold it to his son in 1970. Tom Belfer turned the place into a popular blues destination, at a time when live music was a big part of the North Avenue scene. When Shafton properties bought the building in 1985, Belfer was told to move. Some of his customers were distressed, like John Pountain, 72, a regular for “eight years standing,” he said in a news article announcing the closing. He began frequenting the place after looking in the windows at Hooligan’s and seeing “too damn many hippies.” The Murray Tap soon became his only tavern, he said. Many of those pesky Hooligan’s hippies in 1985 are 72 today, as Mr. Pountain was then. Times change. Rascal’s, which followed the Murray Tap (Belfer owned the name) was co-owned by Andrea Shafton, whose family also owned the building. Vitucci is following this business model by owning and operating the tavern and building. He gutted the place down to the Cream City Brick walls and started anew, refinishing the space and rethinking the business for a changing climate on East North Avenue. 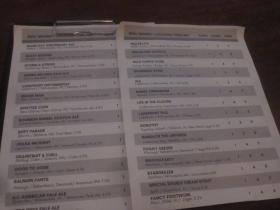 Rascal’s followed a discount model, offering daily $1 drink specials, and extensive happy hours. Such aggressive promotions are necessary to chase the college crowd, especially the heavy-drinking college drop-out crowd, which is sizeable in these precincts, and always a little short on cash. Back when the drinking age was 18, and the neighborhood’s nutritional desires were satisfied by pizza and sub sandwiches, this was a path to riches. But the drinking age is now 21, customers are less likely to be tied to a single “home bar,” and new neighbors were moving into apartments that were springing up in the neighborhood by the hundreds. Many of these are professionals for whom drinks are meant to be accompanied by a meal, and are not to constitute the main course, as had been the case with the college kids. These folks might not drink as much, but they would spend more for a better product, especially if accompanied by good food. Since he was both landlord and operator, Vitucci was in a unique position to find a solution to a dilemma he faced in providing food service, namely the lack of a kitchen in the 1,217-square-foot bar. Building a kitchen within would be expensive, and would reduce the space available for customers. So he walked over to the central unit of his building, at 2315 N. Murray Ave. and had a talk with Dean Cannestra, the owner of Divino Restaurant located there. The Divino kitchen is a good-sized one, and it was arranged that the restaurant could provide food (and dishwashing) for the bar. Vitucci had contractors cut a door through the masonry wall, and a clever partnership was forged. Izzy Hops expects to get about 20 per cent of its sales from food, according to its license application. The facade of the tavern was once again remodeled to accommodate Izzy Hops. 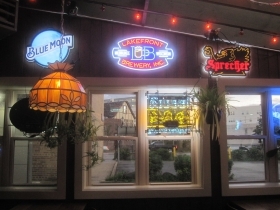 A fine wrought iron sign projects from the front of the building, featuring the tavern’s hop motif logo. 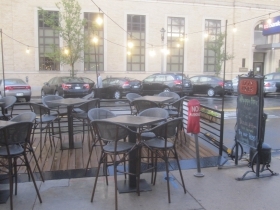 In summer, the parking space in front is dedicated to outdoor seating, joining that of Divino’s, its neighbor to the north, which was the first to introduce this amenity — a parklet — to the City of Milwaukee. 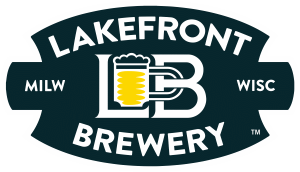 Izzy’s interior has a sparse decoration of mostly upscale beer signs from Sprecher and Lakefront Brewery, where once it was awash in Bud and Miller posters. A sunny garden room has a living wall and struggling hop plants, which take a number of years to get established. It has a lovely wall-mounted fountain; a place of reflection quite unexpected in what had been a rowdy blues bar. The bar itself has been moved to the south wall, opposite its original location. with seating along the north wall, all exposed brick. A black-and-white photo of Vince Lombardi joins what must be hundreds of others in taverns across the state, offering a reminder that the televisions above are designed for sports watching. Table lamps riff on a steampunk theme, being constructed of common threaded pipe. A stunning portrait of Bob Marley could be quite hazardous to the visual health of an aging hippie on mushrooms. The liquors are arrayed on well-lit shelves, and the exposed ceiling feels like it is a mile above the wooden floor. The overall effect is of a clean, functional space, suitable for drinking and dining. 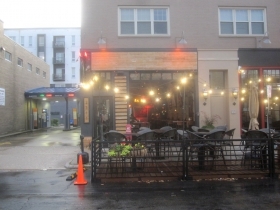 It may represent a trend for the neighborhood, especially if future tavern upgrades elsewhere are done with the same attention to detail and quality as here. Estimated Annual Rent: Tavern: 1,216 s.f. @ $24.05/ s.f. = $29,244.80 / annum rent according to City Assessor estimates. License application shows rent of $1,600 per month, or $19,200 per annum. Operator owns building. Property is assessed at $154,200 for the 10,242-square-foot lot [$15.05/s.f.] and $1,183,800 for the 13,568-square-foot building for a total assessed valuation of $1,338,000. Taxes of $32,997.28 are paid in full. Property: Bought by Murray Avenue Partnership LLC on 12/21/2012 for $818,900 in arm’s length transaction. Registered Agent of property owner is Michael J. Vitucci, who also holds the Class “B” Liquor License. Owner: Izzy Hops, LLC. Michael James Vittuci [D.O.B. 01/21/1965] Agent and 100% owner. Wasn’t this space known as Jakesters before it was Rascals. If memory serves, Jakesters was managed by Andrea Shafton’s then-husband.